On 31 January 2019, at the State Kremlin Palace, the Solemn Act took place, marking the 10thanniversary of the 2009 Local Council of the Russian Orthodox Church and the Patriarchal Enthronement. The text of the address delivered by His Holiness Patriarch Kirill of Moscow and All Russia is given below. While crossing a symbolic border of the tenth anniversary of the 2009 Local Council, we have looked back at the path we trod and at the results of the decade presented to us in the video presentation. I would like to begin my address with the word of gratitude – gratitude to God glorified in the Trinity for what happened in the life of our Church over these years. With particular appreciation I note changes in the organization of parochial activities and the formation of new types of church ministry involving both clergy and laity, namely, the missionary, educational, social and youth work. Not only the capital and big cities see these changes, but also the outlying regions, where thanks to the establishment of 150 new dioceses (altogether there are 309 dioceses nowadays), the parochial life intensified and energetic clergy and young active parishioners appeared. It is of particular importance that 9,386 new parishes were opened, and the total number of parishes has grown to 38,649. I thank all people who helped build up the church life during these years. 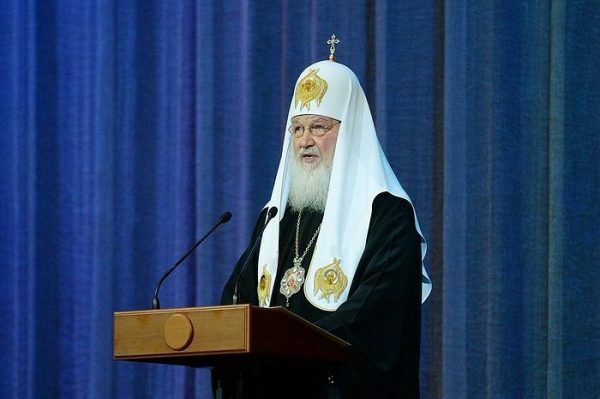 The Russian Orthodox Church carries out its ministry in many countries, having established good relationships with governmental authorities in most of them. I would like to especially thank the leaders of these countries – both who are present here today and who could not take part in the meeting – for constructive cooperation and joint work, as well as for understanding the Church’s role in the state and in society. Regrettably, the lack of such understanding can now be seen with particular clarity in Ukraine, where the Orthodox Church is going through a most difficult stage in its centuries-old history. The constant aggravation of political situation since 2014, the increased pressure on the canonical Ukrainian Orthodox Church by the authorities, the deepening of the Ukrainian schism and the strengthening of radical political forces, followed by Constantinople’s unlawful encroachment on the territory of the Ukrainian Orthodox Church that resulted in the granting of the so-called “autocephaly” to a pseudo-church structure consisting of schismatics, and the adoption by the state of the discriminatory bills at the end of 2018 and in the beginning of 2019 – all this led to the violation of the rights of believers of the canonical Church, to the seizures of its church buildings, and to the kindling of inter-confessional hatred. Despite all this, the Ukrainian Orthodox Church shows an impressive example of firmness in faith and internal unity. I believe that with God’s invincible help in will continue to stand in the truth and light in all these ordeals and that the forces of darkness rising against it will be driven away, “as smoke is driven away” (Ps 68:2). Let us pray that the Church may overcome these temptations, as it overcame heresies and tribulations throughout its history, that fierce winds may abate soon, and that we, untroubled by threats, may continue to build up the Church on its cornerstone – Christ. In my address I would like to share with you my reflections as to what directions we should move in now. Each epoch has its own characteristic features. The Church as the living Body of Christ the Saviour, while preserving its integrity and faithfulness to the Head, is at the same time in the constant process of actualizing the Gospel, of creatively responding to the question of what exactly the Saviour brings to the present-day world. Each epoch had its own tasks, unknown before, and the history shows how the Church tackled them. We may recall the confrontation between the first Christian community and the powerful tradition of the Old Testament legalism; the encounter of Christianity with the versatile heathen world, with the basics of its philosophy and culture; as well as its conflict with the well-oiled and ruthless machine of the Roman state. How did the first Christians, with their more than humble forces, dare to confront these colossi which up to this day determine the character of the European culture and civilization? We know that ultimately Christianity proved to be stronger and triumphed, having become the new leaven and transformed these fundamental principles of social life, state structure, philosophy and antique culture which had seemed inviolable and self-sufficient. Since the day of its foundation the Church has had all the necessary means to save the world, and Christians are called to tell the world about these means, even if today we are being goaded into silence and inaction. The Church bears witness to life eternal and by preserving the Words of God lives in the foretaste of things to come. The Head of the Church is our Lord Jesus Christ the Godman – our principle guide as to what the human being can and must become. For a long time now we have been facing civilizational changes in the world which is ever more rapidly rejecting traditional universal values. A gap widens between the Christian evangelism and the ideological paradigm within which the humanity develops today. Among the conceptions that are being reviewed are those about the Creator, the world and the man, about moral principles, about the relationships between people and about the role of religion in society and private life. All these are not quite new tendencies. As far back as the early 20th century philosopher Vasily Rozanov noted that “existence without higher ideas is defeating and, perhaps, will defeat Christianity, as Christianity once defeated classicism”. Said otherwise, it means that the fight for people’s souls may take form not necessarily of an open attack by evil forces, but of gradual washing-out of selfless love in favour of consumer-oriented comfort, minor and petty goals, spiritual and emotional limpness. It has become obvious nowadays that the insights of the remarkable Russian thinker are coming true with alarming fastness. What we see is the sweeping development of technologies, political and economic changes, shifts in social paradigms, and rarely do these changes bring benefit to the humanity. I will dwell on the most significant challenges facing the Church of Christ in today’s world. The first challenge is the striving to limit the Church’s influence on man and society. Since the dawn of Christianity the archenemy has been rising against the Church of Christ, resorting to different means, from open persecution and oppression of Christians to attempts at declaring Christianity outworn and obsolete. Today’s secular society does not mind to assign to the Church a role of “ethnographic museum,” wherein believers are merely keepers of traditions and have nothing to do with the real life of their contemporaries. However, the Church, as “the pillar and bulwark of the truth” (1 Tim 3:15), is not only the keeper of the lofty time-honoured ideas. The Church is the space of spiritual renewal of man and society. The Gospel of Christ is the life-giving word, the glad tidings about the future of every human being and the whole of mankind. Within the Church a person can achieve true freedom. It is not the irresponsible freedom of “I do whatever I want,” but the freedom of a friend of God, the freedom lying at the core of genuine love and genuine creativity. Indeed, to this day the words about Christ can be “a hard saying” (Jn 6:60). They are difficult to accept for a human being who got into the habit of egoism. On the contrary, the concepts and systems supporting and promoting people’s selfishness and indulging their cravings, whims and lust, hold an attraction inasmuch as they exploit human desire for pleasure and comfort. It is at this everyday utilitarian level that Christianity commonly faces opposition. Today the Church is called to bear witness that the commitment to the religious, first of all, Christian worldview is a salvation from anomie and a pledge of vitality of the modern civilization by means of overcoming egoistic all-permissiveness and violence. The family institution crisis has become an important manifestation of this confrontation. In the modern civilization the notion of family is being eroded beyond recognition. Thrown in the public conscience and actively growing are the seeds of false ideas about the significance of the so-called “gender self-identification,” about the necessity of early sexual development, about the diversity of the marital union forms, and about the naturalness and normalcy of the so-called “trial marriages” and “childfree movement.” These and many other “viruses” destroy the traditional family values. Meanwhile, these two words – family values – do not indicate just one of the ways to achieve the eternal life, but are a pledge of happiness for an individual, a parent and a child here on earth, as well as the solid foundation of sustainable social life. By rejecting the fundamental Christian truths about the human being the civilization is becoming helpless in the face of the chaos destroying human societies and human lives. The second challenge is increasing attempts to interpret scientific data in an ideological, not proper scientific way. It usually affects such disciplines as psychology, sociology, neurophysiology, etc. The Soviet “scientific atheism” became a thing of the past, but ideologists of today’s “scientism” (belief in the omnipotence of science and absolutization of its role in culture) assume that any human problems in the present-day world can be solved by science. Such approach goes far beyond the limits of the role that science can play in human life, and artificially contrasts science with religion. A priest, a psychologist, a psychiatrist – each of them must attend to his/her work and together they must help the human being. The success of their concerted efforts depends, among other things, on the dissemination of the Orthodox Church’s spiritual experience which is not known to everybody. An outstanding philosopher, Ivan Kireevsky, wrote the following, “I have only one wish: that the principles of life preserved in the teaching of the holy Orthodox Church may fully permeate beliefs of all our ranks and classes, that these lofty principles, prevailing over the European enlightenment and not replacing it, but, on the contrary, embracing it with its plenitude, may confer on it a higher meaning and the ultimate development”. I believe that this task is on our agenda today as well, and its fulfillment will help enrich the science and improve people’s life. One of the manifestations of the scientism problem is a risk of dehumanizing the humanity as a result of the spreading of transhumanism ideas, that is, “going beyond human limits” and preaching some kind of qualitative improvement of human physical nature by means of science and technology. Transhumanists often speak of their desire to ease people’s sufferings, to perfect their physical existence. There is nothing bad in pursuing such goals. We know of numerous remarkable scientific discoveries that benefited the humanity greatly. For instance, thanks to medical breakthroughs some of the epidemics which in the Middle Ages had been calamities of global scale, became a thing of the past. The problem is that the transhumanism reduces a human being to his/her biological or, in the patristic terms, bodily constituent and believes that with the view of perfecting it, it is permissible to give up moral norms and go beyond the limits of what is morally admissible. The transhumanism promises the humanity “digital immortality,” the overcoming of physical limitations and, practically, the creation of a new man. Through movies and literature an idea is penetrating the minds of our contemporaries that people need “alteration,” “renewal” or, using computer terms, “upgrade.” This is a new form of anti-Christianity that declares sincere concern for man’s good, but in reality completely destroys the true notions of humaneness and of human being as an image of God. It is very easy to answer a question about future tasks of the Church and its reaction to the present-day challenges. The Church will continue to do what it has always done, that is, to preach the Gospel of the Kingdom of God that has come down to earth. To this day the Church has preserved intact the basic truths about man, his inward life, his spiritual and emotional problems and the ways to solve them. These truths were not invented by us, but were revealed to us by God the Creator of man Who shared with us His Divine plan as to what the man is called to become. With full responsibility the Church says today, as it said thousand years ago: yes, we know what the man is to become. It is not an area of guessing or hypotheses, but sound and expert knowledge. I will name several virtues that have determined the life of the Church since the apostolic times and that help it show the path of development to both individuals and societies. The first virtue is Christians’ attitude to each other. In his Apology, Tertullian, a Christian writer of the 2nd century, refers to the sayings of the heathens about Christians: “See, they [the heathens] say, how they [the Christians] love one another… how they are ready even to die for one another”. This exclamation of amazement shows what lay at the core of the Christian mission. To this day the Christian love can and does manifest itself in sincere personal concern for those who are near, in patient bearing of one another’s burdens. The second virtue, intrinsic to the Church, defines its attitude to everything beyond it. Christians could be loyal to the state, to the social order with its customs, and even to the culture rooted in the heathenism, but with an important reservation, namely, that the loyalty would not affect the faithfulness to Christ’s truth. According to St. Justin Martyr, the Logos is implanted in every race of men, therefore, the best of what was in compliance with the Logos needed to be perceived and rethought, not rejected and denied. “Whatever things were rightly said among all men, are the property of us, Christians,” the martyr wrote in his apology. By their wide and generous worldview the Christian thinkers of the Early Church helped incorporate the best of the antique heritage into the well-designed building of the emerging New Testament culture. The third most important virtue of the Church is its orientation towards the eschatological perspective underlying the Christian understanding of history. While celebrating the Eucharist in remembrance of the Saviour, Christians at the same time felt that the coming of the Lord Jesus was at hand. They lived in the joyful foretaste of the triumph of the Kingdom of God, not in fear of the coming “doomsday.” The celebration of the Sacrament of Thanksgiving, together with deeds of love, was the outset of the new Kingdom – not the Kingdom of this world, but the Kingdom wherein God reigns and love and truth triumph. The Bible speaks not only of the ancient times, but also of the future, when, according to St. Paul, “God may be all in all” (1 Cor 15:28). The whole early Christianity was deeply permeated with the joy of breaking through the creation’s doom to death: the Resurrection of Christ has already come, and it will reach every human being. So, the internal unity in brotherly love, kindness to those around us and to the outer world without any concessions in what concerns the truth of the Gospel, and, finally, the joyful sense of nearness of the eternal Kingdom of Christ and of everyone’s resurrection – these are the three major virtues of the Church that help it show the way to people for transfiguring their personal and social life at all levels. The Church says that the purpose of human life is to attain communion with God and freedom from slavery to sin. That is the Church’s response to the aforementioned temptation of scientism and transhumanism. The technological development itself is harmless, but it can become a false aim if people lose understanding of the spiritual dimension in their life. Man’s “upgrade” is possible, only not through biotechnological transformations, but by purifying the heart from passions and gaining virtues, first and foremost, the virtue of love that likens us to God. While the philosophy of transhumanism offers digital immortality to the humanity, the Lord granted the true immortality to the human being. Today even within the secular scientific community a question arises more and more often: can we say that a fruit of the scientific and technological progress preached by the transhumanism is a man? What are objective criteria of “humanity,” about which anyone daring to “improve” human nature must not forget? We, Christians, have the answer. The standard of humanity is Christ the New Adam Who not only fulfilled the original plan for man of God the Father, but also destroyed by His death and resurrection the fear of suffering and death – the major obstacles that prevent us from having the plenitude of life. According to St. Paul, “no other foundation can any one lay than that which is laid, which is Jesus Christ” (1 Cor 3:11). Today as well God in Christ addresses Himself to the whole of mankind with a simple message that the life of the human being depends, first of all, on his/her ability to love, not on the possession or lack of some high-tech gadgets. Even if, supposedly, the technological development will help prolong considerably life expectancy, what mechanism or what programme can help master the art of selflessness, mercy, respect, kindheartedness, faithfulness, gratitude and compassion? Without the cultivation of these essential qualities the life of people, even surrounded by the newest gadgets, is doomed to inferiority. In fulfilling its task, unchanging for two thousand years, of preaching the Truth about God and man, the Church is called, at the same time, to find appropriate forms and words in order to convey the Gospel message to the contemporaries in plain and accessible language. Of course, it does not imply the “primitivization,” simplification of the Orthodox teaching in favour of the mosaic thinking and superficial omniscience. However, everything that is being said to the outer world on behalf of the Church must prove to be relevant and vital. Our message should not contain beautiful but inapplicable words. Our message should reveal to the world those virtues of a Christian and of a Christian society that I mentioned before. Both priests and laypeople are called to convey this message. A missionary is not a specific profession, but the normal state of any Christian. The missionary is the one bringing the Gospel to those who do not know Christ. By his/her life every member of the Church is called to bear the living and sincere witness to what it means to be with Christ in the Church. This is the shortest and the right way to attain the fullness of life and personal happiness. I have some special words for the youth. All the temptations which I mentioned today, such as disdain for the eternal word of the Gospel, neglect of family, arrogant conviction in the dominance of scientific knowledge over perfection of the inner self, dehumanization under pretence of caring for people, are targeted and will be targeted, first and foremost, at you, young people. But it is you who have all the necessary energy and concern in order not to succumb to these temptations and go along the way offered by the Church through friendship in the highest sense of this word, through openness and creative comprehension of the world around you, but without any compromise with the word of God, through the aspiration to the future and with the understanding that the crown of everything is the meeting with Christ. You – God willing – have many decades of life ahead of you, but even now you are called to change society by changing yourselves. The Church, being the theandric entity, finds itself in society and outside of it at the same time. We should most seriously ponder on bridging the artificial gap between the life of society and traditions of the Church. The Early Church did not fear to incorporate into its tradition the best of what was available, for instance, in the fundamental concepts of philosophy, or achievements of the classical Greek and Roman cultures. Such integration is a very delicate process that demands not only time, but also thoroughness and wisdom. Therefore, it is very important to cultivate an active dialogue of the Church with the world of culture and to considerably expand the area of the Church’s cooperation with scholars. The Church is open to contacts with all those who sincerely wish to maintain this dialogue. A lot of work lies ahead of us. In our domestic mission we should move along the way of cooperation between the Church and society so that the world may open its doors wider for love, compassion and mercy. In the pan-Orthodox context we must take great pains to preserve the unity of Orthodoxy. The result of this work will largely depend on how unanimous and consistent will be the all-Orthodox support for the suffering brothers and sisters in Ukraine and on how convincing and firm we will be in upholding the church order based on the centuries-long Tradition of the Church. I personally ask for your prayers so that the Lord may strengthen me in carrying out the ministry entrusted to me. May God grant the Russian Orthodox Church success in its witness before the entire world to Jesus Christ as the True God and Saviour, and to His Church as the ship of sanctity and love, under the sails of which any person can head for the future with hope! Kireevsly, Ivan. On the Nature of the Enlightenment of Europe and Its Relation to the Enlightenment of Russia. St. Justin Martyr. The Second Apology.